Nancy may not be Paris (and much closer to Luxembourg), but it seems that from a cultural point of view, a lot of interesting things are happening there. After Orwell rediscovered mellow chamber pop and came to indie stardom in the United States, I am holding another more than promising band in my hands, even if the genres couldn't be more different. The easy way out is to describe Elvaron as a progressive metal band, but if you spend more time with their new (already fourth) album The Buried Crown, you will notice a band emphasising creativity instead of just making their music a formal exercise. The guest musicians that are more or less an entire orchestra will guide you into a more symphonic direction, but those parts are actually very hard to find, only encompassing the epic three-part song King Of Thylia and the folkish album closer The Heroes' Tale. Apart from that, the emphasis is just as much on heavy metal as on progressive techniques. In fact it seems at times as if Elvaron are combining early Dream Theater prog metal sounds with the more melodic aspects of thrash and speed metal, the way it was popularised by Megadeth in the late Eighties. 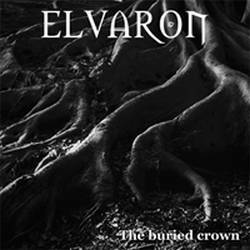 Although Elvaron clearly draw their influences from late Eighties metal, they never sound out of time, because they approach their song writing with a freshness most established bands have lost a long time ago. Right now my two favourite tracks are the two long pieces Ghouls Of Time and The Buried Crown, showcasing Elvaron's ability to combine beautiful melodies with rhythmic complexities, never falling into the trap of melodic power metal (you won't find any of those influences here) and also not exaggerating the weirdness of the rhythmic backbone. The Buried Crown is a progressive thrash-lite metal album, most of the time going straight for the kill, never preoccupied with futile baggage and therefore being somehow an oasis in a desert of too-samey prog albums. There is also a concept behind the lyrics, but the last time I got hooked on something like that was in the late Eighties on the three first King Diamond albums. Eight points for an album that knows to be kinda unique and kinda retro at the same time.